heart henna, a photo by Henna Trails on Flickr. 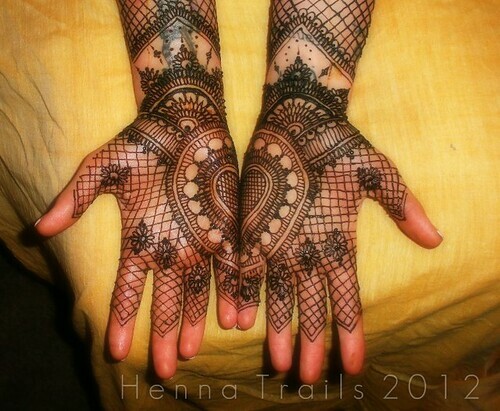 I did some bridal mehndi this week for someone I have known since she was a babe. How exciting to see her grow up into a conscious artistic woman…I totally called it when she was little. This afternoon we will be going to her wedding in a Chico-iconic location for some western themed fun. This bride and groom are gorgeous and creative free thinkers…I can’t wait to see what they have up their sleeves! I’m off to henna and then braid my hair and get out some stylish western wear. This design is inspired by Asha Savla’s Vivaah, and a touch of Deepika Chauhan’s Shangar part II. Gorgeous intricate design, with heart and everything perfect wedding theme! Thanks so much, it was a n honor to be a part of their wedding. much love.